Raising a gifted student can sometimes pose a challenge along with the great reward. Here you will find links and resources you may find useful in your academic journey with your child. The Gifted and Talented Program holds three yearly programs. 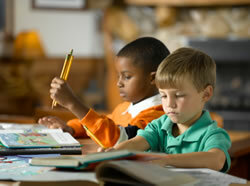 Programs address various topics to support the learning and well-being of the gifted child. If you would like more information please contact the GT office at 671-8170. This site offers "all things gifted" for the parent. You will find information from what it means to be gifted to games and toys. The NAGC site offers practical tips for parenting, advocacy, and other resources such as summer camps. This site is best described as an online support community. There are various resources that you find to meet your families specific needs. The Council for Exceptional Children has a sub group for Gifted Children. This page provides their resource information. Twice Exceptional children exhibit giftedness and a learning disability. This newletter gives tips to help parents advocated for their children. Ideas to help support the unique emotional needs of a gifted child.